Today’s blog post is a big shout out of thanks to Sean Doherty at Doherty Interior Design in Roanoke, Virginia. Sean added a stunning Antique Scottish Drumhead Grandfather Clock from EuroLux Antiques to complete a new design for a client’s office. Antique Scottish Drumhead Grandfather Clocks are rather difficult to find, but this one, which dates to circa 1820, is particularly beautiful with a very attractive mahogany veneer case. The bonnet is crowned with a ball and spire finial and decorative flourishes, while a floral motif wraps around the base of the bonnet. Antique Grandfather Clocks, also known as Antique Tallcase Clocks or Antique Longcase Clocks, were first created around 1670 with the invention of the anchor escapement mechanism. A long pendulum that only needed to swing 4 to 6 degrees was able to power these longcase clocks and kept much more accurate time than earlier clock mechanisms. Antique Grandfather Clocks were custom-made by hand for their owners through the 1800s and were considered to be status symbols for the very wealthy. Pendulum clocks would hold the record for the world’s most accurate timekeepers for the next 270 years, until 1927 when the quartz clock was invented. Sean’s classic design for this stately and elegant office, which included the Antique Drumhead Grandfather Clock and beautiful gold silk fabric on the walls, was given a vibrant splash of color with a set of apple green leather armchairs around a banded mahogany conference table. We’re glad to hear that Sean’s customer was well-pleased with the finished design. Here at EuroLux Antiques, we’re always happy to help interior designers find the perfect antique piece to complete a project! 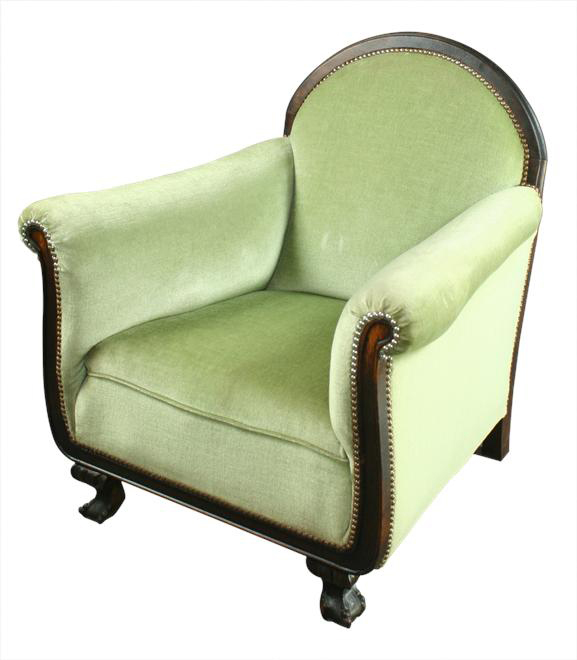 Thanks for stopping by the EuroLux Antiques Blog and be sure to check out Doherty Interior Design on FaceBook. Let Sean know how much you enjoyed his work! This entry was posted in Client Spotlight and tagged Antique Grandfather Clock, Antique Longcase Clock, Antique Scottish Drumhead Clock, Antique Tallcase Clock, Doherty Interior Design, Sean Doherty on October 29, 2011 by euroluxantiques. 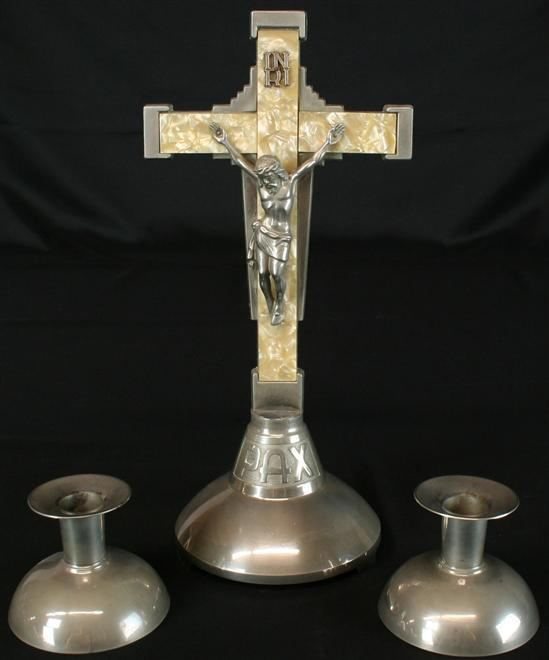 What is the Art Deco Style of Antiques? 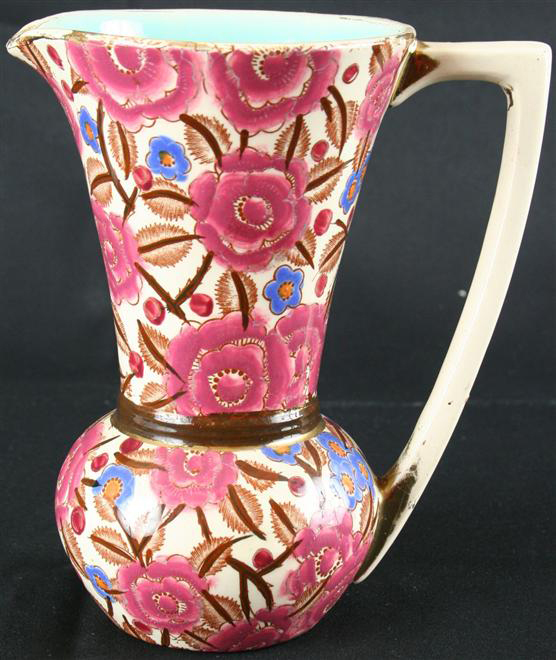 As an antiques dealer, I am often asked how I determine the approximate age of an antique or vintage item. 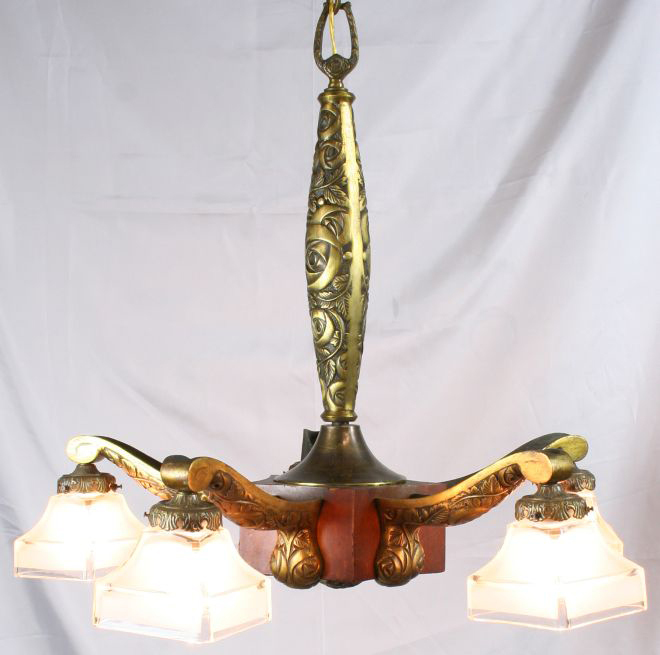 While the true answer to that question is from the experience gained through many years of directly handling antique and vintage items, one aspect of any determination of age is the aesthetic style or design of the item in question. 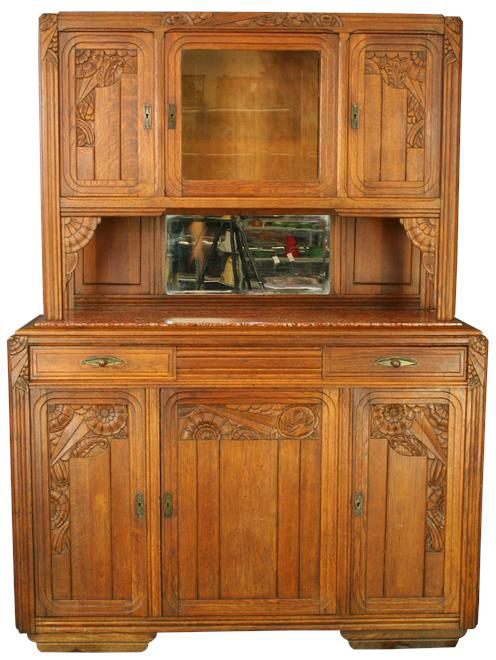 And to this end, the Art Deco style of antiques is one of the easiest styles to recognize. 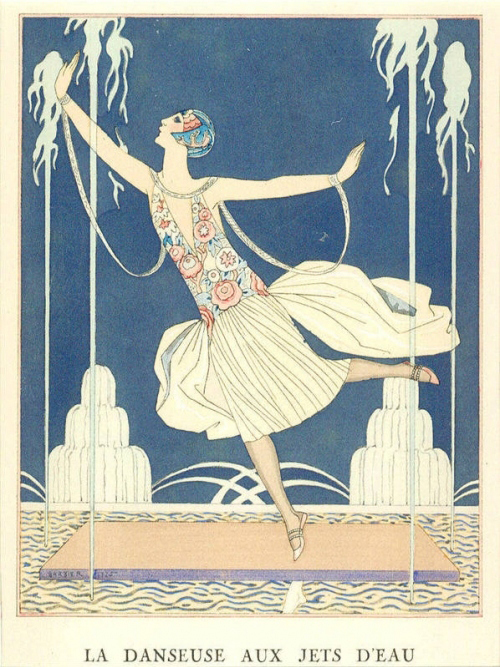 Prior to World War I, the Art Nouveau style reigned the aesthetic world from 1890 to 1914, with an emphasis on lavish, free-flowing designs, which focused on organic motifs. However, by the time World War I ended in 1918, people around the world had experienced a sobering loss of innocence that profoundly affected our global consciousness, and which, of course, was reflected in the art and design of the 1920s and 1930s. 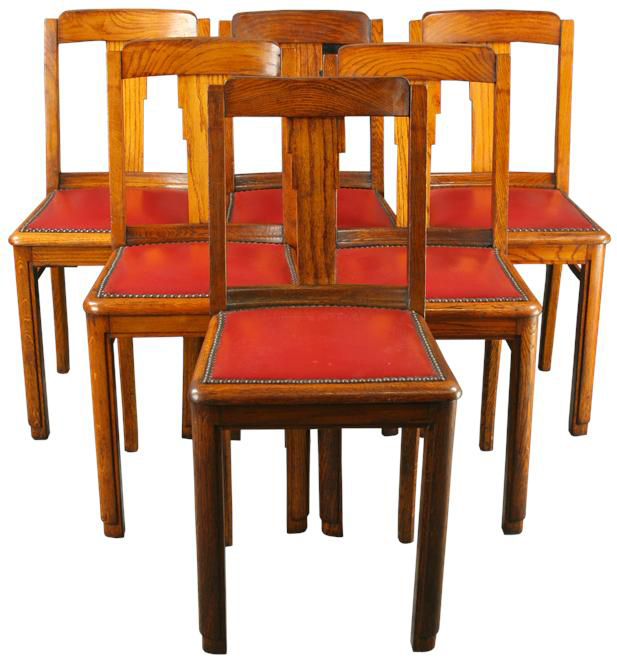 Consumers were no longer interested in the elaborate carvings and extravagant nature of Victorian and Revival design styles after WWI, but instead demanded a new modern style based on simplicity and a streamlined design, such as the Set of 6 Antique Art Deco Dining Chairs above. At the same time, consumers were fascinated by new technologies that were recently introduced to the world: the radio, the television, the automobile, the airplane, and architectural wonders known skyscrapers, such as the Chrysler Building and the Empire State Building in New York City. Ever wonder how the name of this modern, streamlined aesthetic originated? It all began at The International Exposition of Modern Industrial and Decorative Art (Exposition Internationale des Arts Decoratifs et Industriels Modernes) that was held in Paris in May of 1925 to showcase the new, modern, and functional design of France. Forty three years later in 1968, a museum exhibition was held of many pieces from the 1925 Paris Exposition, and that is when the term Art Deco was first used to describe this exuberant style, firmly rooted in the promise of the future. Early Art Deco style of the 1920s uses dynamic, sweeping curves, which give the feeling of velocity and speed, and the aerodynamic design of airplanes and automobiles. 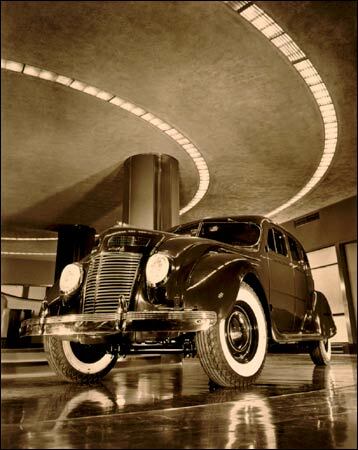 The Art Deco style at its heart is the celebration of the Age of Machines, of the optimism of spirit that announced the future had already arrived, and it had been carried on the wings of technology. As the Art Deco style progressed through the 1930s, emphasis shifted away from sweeping curves, switching instead to a focus on rectilinear lines and geometric shapes. These geometric shapes were often fractionated, reflecting the Cubist influence of the contemporary artist, Pablo Picasso. Key attributes of the Art Deco style are the use of geometric shapes, zigzags, trapezoids, chevron and starburst patterns, as well as the stylized use of flowers and animals such as gazelles and birds. The Antique Art Deco Buffet and the Antique Art Deco Vanity above show the focus on a rectilinear design in combination with stylized flowers, as does the Antique Art Deco Chandelier below. 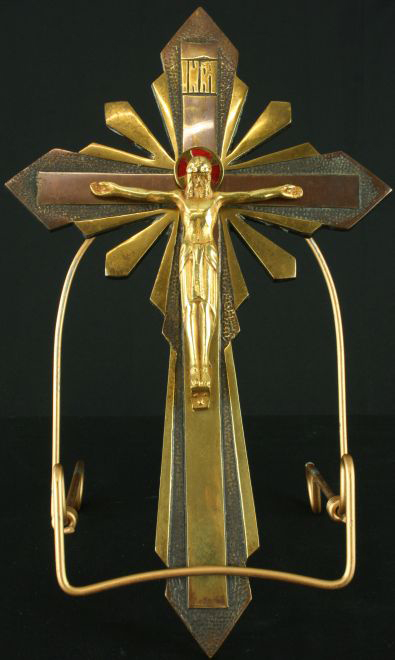 Notice the sunburst design combined with stylized lettering on the Antique Art Deco Crucifix below. A dramatic and bold color palette was favored in Art Deco design. 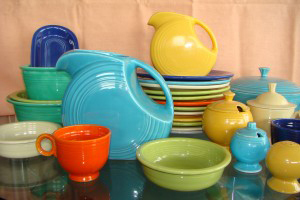 Bright yellow, red, orange, green, and blue were used abundantly, especially in the joyful dishware line called Fiestaware in the United States. After the stock market crash of 1929 when unemployment reached 25% in the US, inexpensive Art Deco products in cheery colors were still in demand as they helped boost sagging spirits, while the focus on technology and the future promised better things to come. 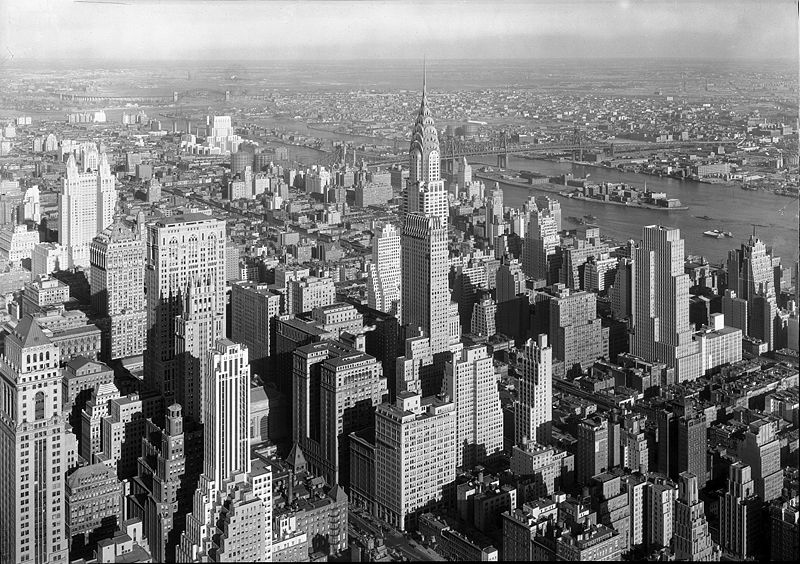 Art Deco designs took center stage at The World’s Fair in Chicago in 1933, and again in 1939 in New York City. The most prominent architects of the Art Deco era include the streamlined designs of Frank Lloyd Wright and the father of the steel and glass Bauhaus movement, Walter Gropius. In furniture design, Emile-Jacques Ruhlmann and Jules LeLeu ruled the day, while outstanding glassware was designed by Rene Lalique, whose style was inexpensively reproduced and later became known as Depression Glass. 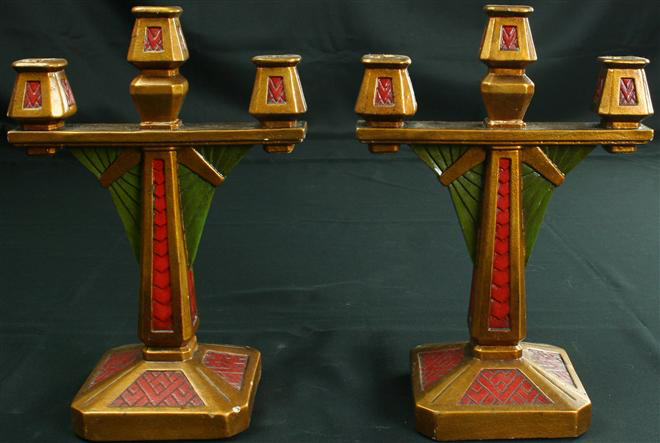 I hope you enjoyed learning about the vibrant Art Deco style of antiques, and that you agree it is quite easy to recognize. This entry was posted in Antique Furniture, Learn History & Styles and tagged 1920s Design, 1930s Design, Antique Art Deco Furniture, Antique Furniture, Art Deco, Art Deco Antiques, French Art Deco, History of Art Deco Style on October 21, 2011 by euroluxantiques. 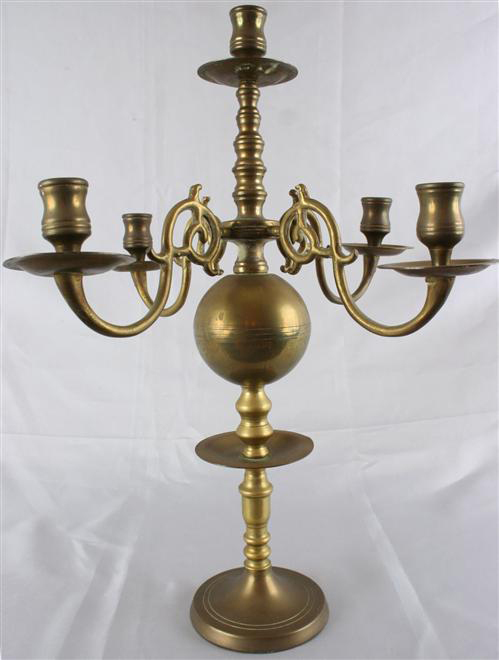 Hans J. purchased this charming Vintage Flemish Candelabra from EuroLux Antiques and let us know that it was for his Dutch Room in Cambridge, MA. We were very intrigued and asked Hans to send us photos, which he was happy to do! He further explained that he grew up with European antiques because his family owned a small antiques shop when he was a child. His father was born in Austria, but grew up in Germany, while his mother was born in Delft, Holland. Hans explained that this room is meant to evoke the feeling of a Dutch interior around 1690 during the Golden Age of Northern Baroque Art. Of course, as the Dutch were international traders, there are items in the room of English and German origin too. 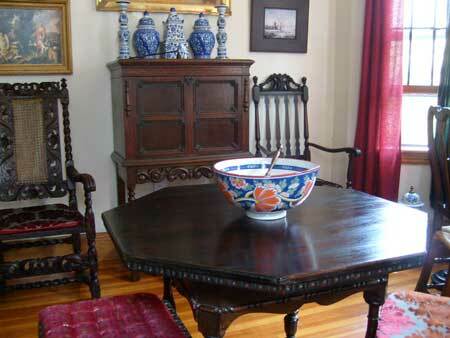 None of the items in the room actually dates to the 17th century, but mostly are from 1900 to 1930. 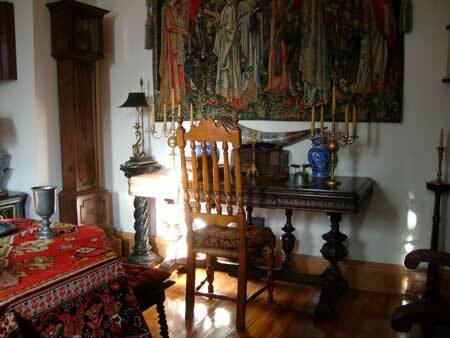 The table carpet on the octagonal Dutch table was purchased by Hans’ parents in the Netherlands in the early 1970s. 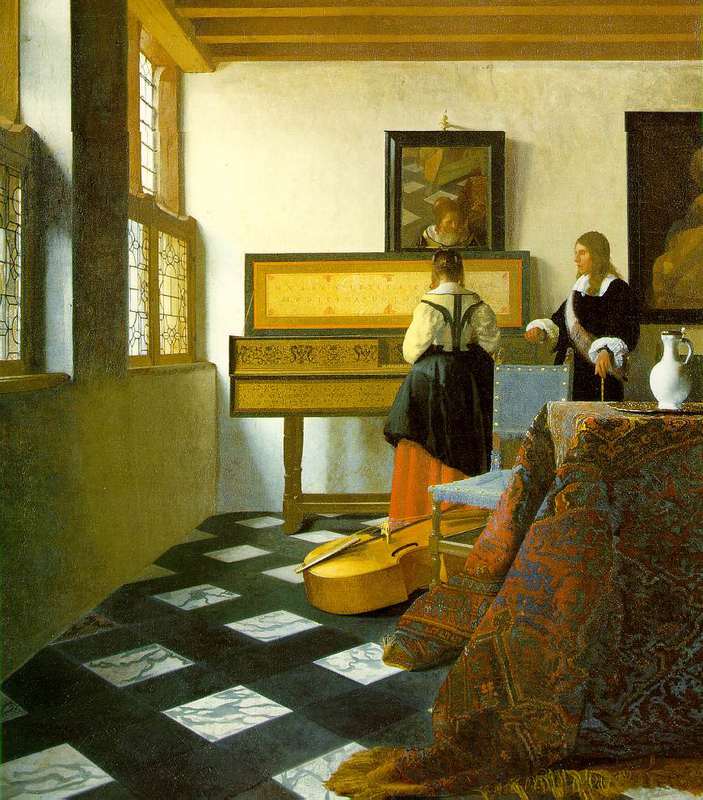 I’m so impressed with Hans’ Dutch interior because it looks like it could have been the setting for one of Johannes Vermeer’s paintings, such as the Music Lesson above. 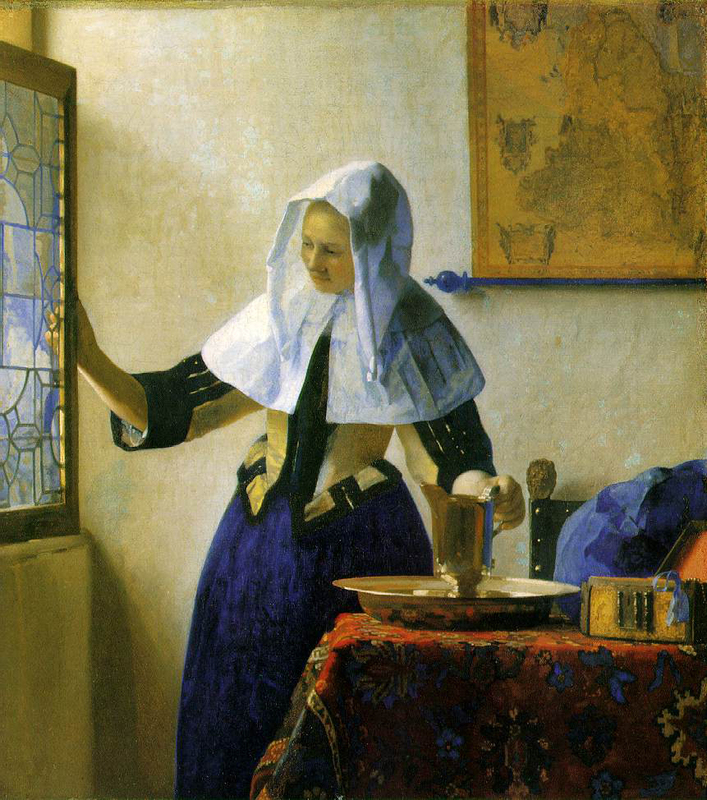 Vermeer, arguably one of the greatest Northern Baroque painters, was known for painting women in Dutch interiors and was a true master at depicting natural light falling through a window. In Hans’ room above, notice how the natural light spills across the table from the window over the harpsichord, which Hans’ parents built from a kit in the 1960s. Hans built the stand and added the landscape painting on the interior of the instrument. Perhaps you might be more familiar with Vermeer’s most famous painting, Girl with a Pearl Earring, (first photo above) since it was the basis of a book by Tracy Chevalier, which was then made into a movie starring Scarlett Johansson (second photo above) in 2003. The movie just happens to be one of Hans’ all-time favorite films! This photo of Hans’ Dutch Room features several pieces of Blue Delft ceramics surrounded by framed prints. 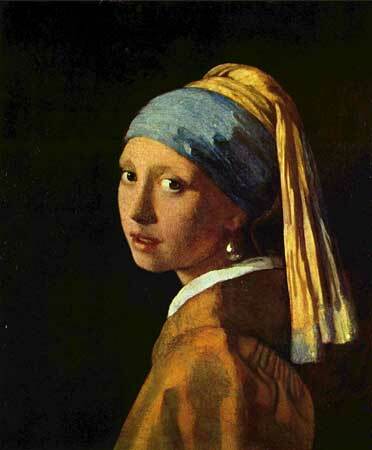 Can’t you just imagine that Vermeer’s Girl with the Waterpitcher just stepped out of the room? The Vintage Flemish Candelabra that Hans found at EuroLux Antiques has a new home on a refectory table underneath a tapestry and has now become part of a nearly identical pair in Hans’ Dutch Room. 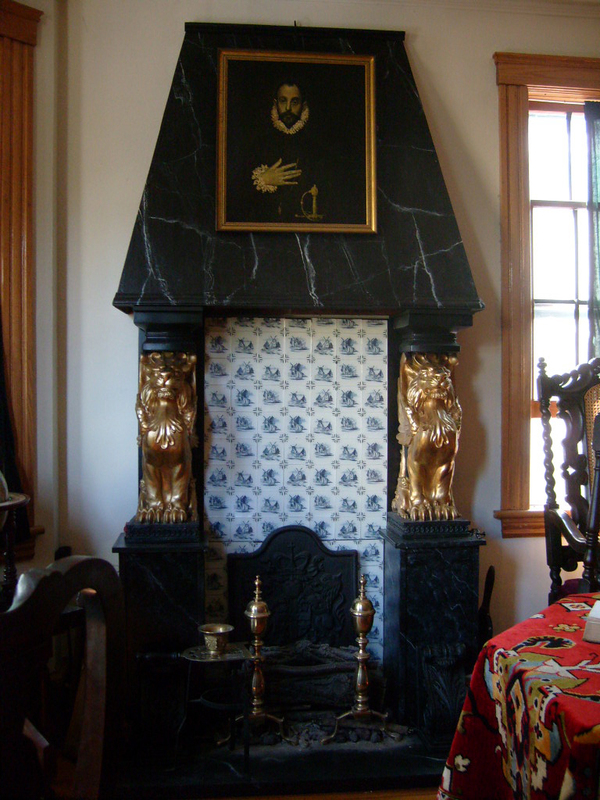 Hans even created a fireplace that is typical of those found in Holland, Belgium, or France in the mid to late 1500s, in order to give a deeper sense of history to the room. The fireplace is made from plywood and painted to look like stone. The Delft tiles are plastic stick-on tiles, although they look like ceramic tiles. He can actually have a fire in it by the use of canned jelled alcohol behind ceramic logs, and can even heat water for tea by the use of a hanging kettle. 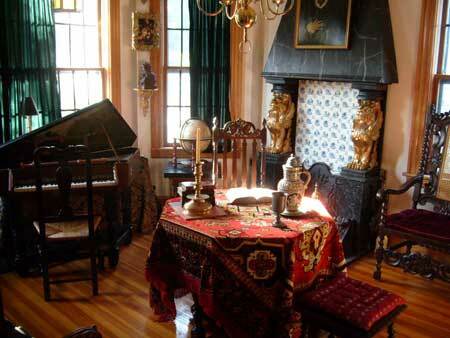 In my opinion, the most incredible part about Hans’ Dutch Room is that he rents his home, and has not been able to make any structural changes. I am completely in awe of Hans’ ingenuity and dedication to creating a beautiful and stunning 17th century Dutch interior! Nicely done, Hans – two thumbs way up! 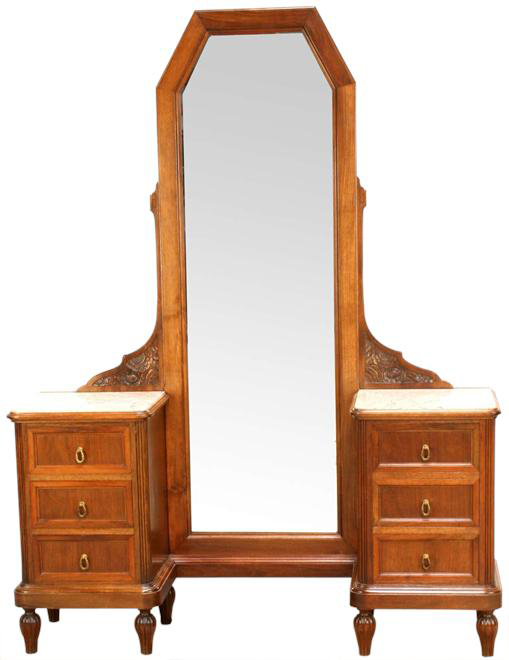 As always, we’d love to see photos of items purchased at EuroLux Antiques in their new home! This entry was posted in Client Spotlight and tagged Antique Furniture, Dutch Antiques, Dutch Interiors, Flemish Candelabra, Girl with Pearl Earring, Northern Baroque Interiors, Northern Baroque Style, Vermeer on October 10, 2011 by euroluxantiques.